The stock analysis page contains stock tools allowing you to find correlations between stocks. Linear correlation can reveal stocks that have moved up or down in percentage terms either together or opposite of each other. AiStockCharts.com uses the median % daily price change of 2 stocks in the calculation of the linear correlation coefficient. This differs slightly from many websites that use the mean instead of the median. All of the data is still considered. An equal number of outliers at either extreme of the data do not influence the median (the value in the middle). However, the mean (average calculated by adding up all the data and dividing by the number of data points) can be greatly influenced by outliers, especially for small sample sizes. An example of this phenomenon is a stock specific event where the stock shoots up 185% in 1 day. Stocks can have a non-symmetrical distribution of % daily gains. Stocks can lose 100% of their value, however can gain in price by a much larger percentage. Scatter plots help identify the nature of the distribution of daily % stock price changes. The problem in relying solely on a correlation coefficient to describe the strength of the relationship between data sets is shown on the scatter plots below. Scatter plots that consist of all data points forming either a vertical or horiztonal line indicate that the linear corrleation is undefined. Linear correlation exists between the 2 variables only if each variable has a non-zero finite standard deviation. All 4 response variables have the same mean (7.5), standard deviation (4.12), correlation (0.81) and regression line (y = 3 + 0.5x). However, as can be seen on the plots, the distribution of the variables is very different. The first one (top left) seems to be distributed normally, and corresponds to what one would expect when considering two variables correlated and following the assumption of normality. 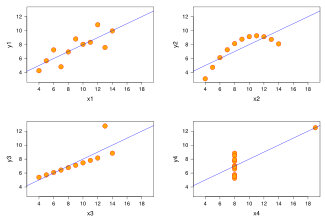 The second one (top right) is not distributed normally; while an obvious relationship between the two variables can be observed, it is not linear, and the Pearson correlation coefficient is not relevant. In the third case (bottom left), the linear relationship is perfect, except for one outlier which exerts enough influence to lower the correlation coefficient from 1 to 0.81. Finally, the fourth example (bottom right) shows another example when one outlier is enough to produce a high correlation coefficient, even though the relationship between the two variables is not linear. These examples indicate that the correlation coefficient, as a summary statistic, cannot replace the individual examination of the data. Linear correlation coefficient values range between -1 and 1. It is important to understand that high correlation does not necessarily mean that there is an underlying fundamental relationship between the stocks, however can offer some insight for further investigation. A correlation value of 0 suggests that the stocks daily percentage movements were independent of each other (not correlated). We cannot state that historical data causes a specific move in a stock since new variables can crop up anytime and make the model invalid or unpredictable. Also, there is the possibility of pure coincidence or confounding variables creating the appearance of a relationship between 2 stocks when in fact there is none. AiStockCharts.com plots a best-fit line on the scatter plot of 2 stocks to show the relationship of the variation between the 2 stocks. This relationship is quantified by BETA and shown on the graph using ß, the slope of the best-fit line. BETA is commonly used in finance and often calculated using ordinary least squares regression. When calculated this way the BETA is the slope of the fitted line resulting from the least squares regression calculation. The problem with the usual interpretation is that BETA when calculated this way is not comparing the relative volatility (variation between the 2 stocks). Instead, it is the correlation coefficient multiplied by the relative volatility. Therefore, a low beta could represent a high relative volatility masked by a low correlation. Investors would then be mistaken in thinking that they had selected an investment with low relative volatility. To avoid this common mis-interpretation AiStockCharts uses the ratio of the variation (standard deviations) of the 2 stocks daily % changes multiplied by the sign of the correlation coefficient. Tofallis, Chris, 'Investment Volatility: A Critique of Standard Beta Estimation and a Simple Way Forward' . University of Hertfordshire Business School Working Paper No. 2004:3 provides a discussion of this, together with a real example involving AT&T. The graph showing monthly returns from AT&T is visibly more volatile than the index and yet the standard estimate of beta for this is less than one. The BETA calculation affects the value of ALPHA, a commonly used metric to compare investments or investment managers performance. ALPHA is the y-intercept of the best-fit line (where the purple line crosses the vertical yellow y-axis). ALPHA represents the estimated extra % profit (when positive) generated by the stock plotted on the y-axis versus the stock on the x-axis when the percent change of the stock on the x-axis is zero. ALPHA is shown at the top of the scatter plot to the left of ß. Two huge problems can result from the common way of calculating ß in finance. First, the absolute value of ß is too small. Second, ALPHA can be overestimated or underestimated depending on the location of the centroid represented by the intersection of the median daily % price changes for the stock and the index. In other words, risk is underestimated and reward can be overestimated or underestimated. As mentioned above, AiStockCharts does not use the common way of calculating ß. The following table shows problems that can arise when using the standard estimate for ß. * Based on the Cartesian coordinate system. Assumes a linear relationship exists and the magnitude of CC is sufficiently large to make estimates. AiStockCharts does not use the standard estimate for ß.
r² (the correlation coefficient squared) is a measure of how predictable the least squares regression line was in the past to predict the daily % change of the stock on the y-axis when given a daily % change in stock price for the stock on the x-axis. Aistockcharts.com uses r² based on my modified correlation coefficient calculation in order to calculate RR (Adjusted Reward to Risk Ratio). The correlation coefficient (CC on the scatter plot) is an indicator showing how closely correlated the stocks daily % changes in price are to each other. Outliers are excluded. Date of last data point located at the center of the aqua X. All dates must match for each day between stocks or the plot will not get produced due to lack of data. Negative, Zero or Positive with no upper limit. -100% is the lower limit. ALPHA represents the estimated extra % profit (when positive) generated by the stock plotted on the y-axis (green ticker) versus the stock on the x-axis (red ticker) when the percent change of the stock on the x-axis is zero. ALPHA is shown at the top of the scatter plot to the left of ß. ALPHA is located where the purple best-fit line crosses the y-intercept of the vertical yellow line. ALPHA depends on BETA (ß). Negative, Zero or Positive with no upper or lower limits. Slope of the best-fit line on the scatter plot of 2 stocks that describes the relationship between the variation (volatility) between the 2 stocks. Example: Given a correlation coefficient of 0.82, ALPHA = 0 and ß equal to 1.62 for GE versus VTI (the ETF stock designed to track the performance of the CRSP US Total Market Index) we can conclude that when VTI has gone up 1% that GE has gone up approximately 1.62% the same day. BETA (ß) is the ratio of the standard deviations of the 2 stocks using the median instead of the mean for each of the 2 stocks in the calculations of the sums of the squared deviations to the median daily % stock price change. Outliers are excluded. Beta also uses the same sign (positive or negative) as the correlation coefficient. Positive, Negative or 0 slope. Generally the best-fit line geometrically in the x & y coordinates of all individual data points on the plot. There are an equal number of individual data points above and below this line (given an even number of points). The slope of this line is BETA (ß). The beta line does NOT always cross the intersection of the 2 gray lines (medians). x = 0 for vertical line. y = 0 for horizontal line. x & y axes. Vertical line is where the stock on x-axis has a daily % change in stock price of zero. Horizontal line is where the stock on the y-axis has a daily % change in stock price of zero. (Vertical Line): x = Median daily % stock price change for red ticker symbol. (Horizontal Line): y = Median daily % stock price change for green ticker symbol. The purple line does not always pass through the origin of the 2 gray lines. Vertical line is the median daily % stock price change for the red stock symbol. Horizontal line is the median daily % stock price change for the green stock symbol. Numbers at the top & bottom of the y-axis. The maximum and minimum daily % change in stock price of the green stock ticker symbol labeled on the y-axis. The number of days (data points) included are indicated immediately below the green ticker symbol. Numbers at the left & right of the x-axis. The maximum and minimum daily % change in stock price of the red stock ticker symbol labeled on the x-axis. The number of days (data points) included are indicated immediately below the green ticker symbol. Number of days indicated below the green ticker symbol. Minimum value is 30 days. Maximum is the number of days the selected tickers have traded since January 2, 1992. Default is the last 60 trading days (about 3 months). The number of days (data points) included on the scatter plot. If the requested number of data points exceeds the maximum available points then the maximum is used instead. The data shown is based on days that the US stock market is open so one year of data is about 252 days, not 365 days. Calendar icon - Go back in time by selecting an end date. From January 2, 1992 to present. Click on the calendar icon and select an ending date in which to display data points. Currently does not work with Firefox. Works with all other browsers tested such as Internet Explorer and Safari, just to name a couple. Dots on the scatter plot. The % daily change in stock price of the green ticker symbol versus the red ticker symbol. Hover your mouse pointer over a dot to read the date and values. Outliers are shown as red dots and will become clickable to show news and other stock specific information. The aqua colored dot represents the oldest data point. The 5 large dots indicate the most recent days worth of data prior to the last day (indicated by a large X). Large red dots indicate outliers. Today's (or selected date) % daily change from yesterday's close in the stock price of the green ticker symbol versus the red ticker symbol. The date in blue at the top of the plot indicates the date of this data point. If the X is red then this indicates an outlier. Green & Red shaded areas. The shaded green area represents outperformance of the green ticker to the red ticker. The red shaded area represents underperformance of the green ticker to the red ticker. The line where the green and red shaded areas meet is where the daily performance of the green ticker equals the daily performance of the red ticker. The white line between the green-red shaded boundaries represents a beta line where alpha equals 0 and beta equals 1. Aistockcharts.com refers to this line as the Par Beta line. -1 to 1, zero is allowed. The linear correlation coefficient of the red ticker symbol versus the green ticker symbol. This is not a Pearson correlation coefficient. The calculation on aistockcharts.com is the same as the Pearson calculation except it attempts to geometrically minimize the distances from each data point to the purple line and is based on medians, not means. Also, the correlation coefficient calculation on aistockcharts.com uses daily price percentage changes. It is not the correlation between prices. It is thought that calculating the correlation coefficient using daily percentage changes gives a better representation of the correlation between securities. In general, the correlation coefficient is a good measure of 'tightness of fit' of the indvidual data points to the purple line. Generally a low percentage of the number of data points shown on the plot. Extreme % changes for either of the 2 stocks shown on the plot. These data points are shown as red dots and are excluded from the standard deviation calculations. Thus, outliers are also excluded from alpha, beta and the correlation coefficient. Outliers can significantly distort the values of alpha, beta and the correlation coefficient when included in the calculations. no upper or lower limits, negative and zero values are allowed. The sign of the RR Score is the same as the sign of alpha. If the text displaying RR Score is red then that indicates 1 or more outliers exist. A measure of the past adjusted reward to risk ratio. A high positive RR Score indicates reliable past success of achieving higher gains on average for the green ticker versus the red ticker. A large negative RR Score indicates reliable past success of achieving higher losses on average for the green ticker versus the red ticker. RR depends on alpha, beta and the correlation coefficient. Alpha can be thought of as reward, beta as risk and the correlation coefficient squared as predictability of the % change in the stock price data to the best-fit purple line. Keep in mind that nobody can predict the future and errors exist in calculations. Values can range from 0% - 100%. Percentage of data points where the green ticker daily percent gain outperformed the red ticker daily percent gain. Any positive or negative value (usually between -10 and 10). A positive value indicates more variation in the daily percentage changes above the beta line (purple line). A negative value indicates more variation in the daily percentage changes below the beta line (purple line). A value of zero indicates the same variation in the daily percentage changes above AND below the beta line (purple line). The scatter plots on Aistockcharts.com will only graph data and calculate the correlation coefficents for at least 30 data points so that significance testing is performed on the data each time a plot is requested. The first value gives the probability that a non-zero linear correlation between the 2 stocks daily % price changes existed. The second value is the percentage of the variation in daily % price changes of the green ticker not explained by daily % price changes in the index variable (red ticker). no upper limits; -100% lower limit; zero allowed. VTI % Change default value is the last daily % change in VTI stock price. Type in a value for VTI % Change then click the 'Calculate' button to get the predicted % change in the Green ticker stock price based on historical data displayed on the plot.